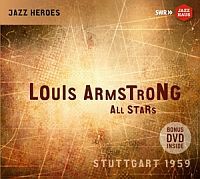 This remarkable release presents a concert given by the great Louis Armstrong on February 15, 1959 at the Liederhalle in Stuttgart, Germany. Although portions of this wonderful performance have been circulating on YouTube in low quality, this is the first time that both the complete concert (in audio) and all existing filmed segments from the show (on the DVD) are presented on disc, both taken from the original tapes and, thus, in excellent sound and image quality. It was a true delight to watch Satchmo in action at the beginning of 1959. It must be noted that shortly after during the same European tour, in June, he suffered a heart attack in Spoleto, Italy, which although in no way diminished his musical capacities – he had yet to offer such gems as his LP with Duke Ellington – did force him to slow down and limit the energy put into each concert. On this performance you can enjoy Louis at his best, performing some of his perennial classics, but also some lesser known masterpieces, such as “I Get Ideas”, the arrangement made for him of the tango “Adiós muchachos”, which he had heard during his 1955 South American tour and which, for a short period, entered his concert repertoire.